"When I look into the eyes of a cat, I fell like it's looking into my soul. For some, that can be a little frightening; for others it can be a real closeness. The little girl in my painting is discovering that special closeness. She is enjoying the moment with her friend - a little girl and her cat just passing the time away." 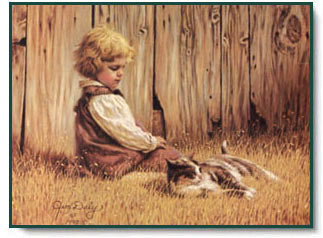 Good Company copyright © 1992 by Jim Daly.